Religion was supremely important in Aztec society and the priestly class enjoyed the privileges on par with the nobility. The magnificent Aztec pyramids had religious motivation and at the top of these unique step pyramids, Aztec temples were made. The Aztecs built some of the most fascinating pyramids during the 14th, 15th, and 16th centuries at the height of the Aztec Civilisation. This included the largest pyramid in the world by volume, the Great Pyramid of Cholula. 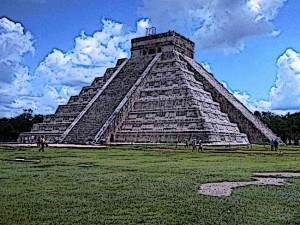 The temples at the top of the pyramid were used for prayers and various rituals including the human sacrifice. Aztec Temple of the feathered Serpent Teotihuacan – The first Aztec temples were made during the early 15th century. The first Aztec temples were made during the early 15th century when the Aztec Empire was established with the dominance of the Mexica people over other ethnicities of the region. The exact reign is thought to have begun in 1428 and this lasted until 1521 when the Spanish Conquistadors arrived in the new world. However, the pyramids themselves existed before the Aztec’s and these pyramids were renovated and converted into grand temples by the Aztec’s. An example is the Great Pyramid of Cholula whose construction began in the 3rd century BC and it was completed around the 9th century AD. The pyramids assumed increasing importance in Aztec religion and meticulous care was taken in their being the correct dimensions and well proportioned since astrology was important in Aztec religion. Broadly speaking, there were three main types of pyramids that the Aztecs built. 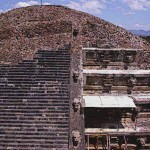 The first is called the twin stairs pyramid where two temples were located at the top of the pyramid. Every temple was dedicated to its own deity. Another distinguishing character of these large pyramids was a square shaped base. The second type was a round pyramid which was dedicated to the god of wind, Quetzalcoatl. These pyramids were less common compared to the twin stairs pyramid. The third type of pyramids was of a small pyramid with just one temple and one set of stairs. These temples were built in smaller cities and, just like the twin stairs pyramid, had square shaped base. The most famous one of all Aztec temples is Templo Mayor which had a height of 60 meters and was dedicated to the gods Huitzilopochtli and Tlaloc. The construction of this temple was completed in 1497 and it was built of stone along with stucco covering and polychrome paint. This temple was part of the sacred area of the city of Tenochtitlan. The Pyramids of Sun and Moon were also religious temples which were dedicated to the gods of sun and moon, Tlaloc and Chalchihuitlicue. Although this temple was not built by the Aztec’s and was exited before them, it was considered sacred by them. Another famous pyramid temple that was not constructed by the Aztec’s but adopted by them as a sacred place was the Great Pyramid of Cholula. Aztec temples located at the top of Aztec pyramids were called “Teocalli” which means “God houses”. Aztec priests managed these temples which were used for worship, prayers, and various offering to the gods, including human sacrifice. The main religious building of the capital of Aztec Empire, Tenochtitlan, was Templo Mayor. It had two shrines at the top which were dedicated to the gods Huitzilopochtli and Tlaloc. Various rituals were performed in these temples including blood-letting, music worship, and burning of tree resin. However, the supreme offering was the human sacrifice for which war captives were used. Aztec’s had a month of twenty days which amounted to 18 months per year. At the end of every month, religious festivities were held and humans were sacrificed on the pyramid temples. The temples at the top of Aztec pyramids were dedicated to specific gods and thus the worship varied from temple to temple. For instance, the most famous Aztec Pyramid, The Templo Mayor, had two temples at the top which were dedicated to gods Huitzilopochtli and Tlaloc. Huitzilopochtli was the patron god of the Mexica people while Tlaloc was the god of rain and fertility. The Pyramid of the Moon was dedicated to Chalchihuitlicue who was the goddess of lakes and streams. Aztecs worshipped many gods who served specific purposes and were thus separately worshipped. Various other gods and goddesses in the Aztec pantheon included Xiuhtecuhtli the god of fire, Centeotl the god of maize, Citlalicue the goddess of the Milky Way, Tlaltecuhtli the god of the earth, Tlaloc the rain god, and others. Aztec Step Pyramid in Teotihuacán – The Aztec’s built some of the most magnificent pyramids of the Americas from 14th to 16th centuries. The design of Aztec pyramids is central to the Aztec architecture and they used various innovative techniques in the construction of these pyramids. Tools like stones, blades, and chisels were used in the construction process which, although primitive, could do wonders. The Main focus was given to building strong foundations since the soil was swampy and it could damage the foundations. Volcanic stone called tezontle was used in the construction of the base while materials such as rubble and limestone were also used in construction. Various symbols were incorporated in these pyramids and temples signifying different concepts. For instance, the symbol of eagle represented the sun and the warriors while serpents represented water or fire. Similarly, conch shell served as the symbol of fertility while various sea creatures were used as Tlaloc symbols. The stairs of the Aztec temples always faced west towards the sun. 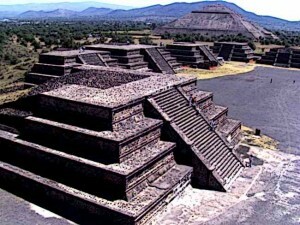 The Aztec’s built some of the most magnificent pyramids of the Americas from 14th to 16th centuries. This included the largest pyramid in the world with respect to volume, The Great Pyramid of Cholula. These pyramids were built in various shapes and had temples at the top. These temples were central to Aztec religion and were used for various religious purposes such as worship, prayers, and offerings to the gods. In these offerings, human sacrifice was of supreme importance. Aztec’s used various innovative techniques and diverse materials in the construction of Aztec pyramids. Also, these pyramids and temples were very well proportioned and always faced west towards the sun. Rich symbolism was also part of the architecture of Aztec pyramids.